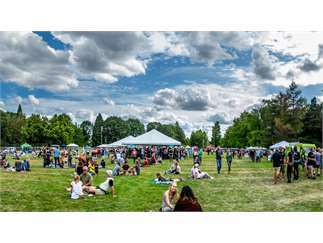 Throw down a blanket and enjoy a beautiful summer day in Westmoreland Park tasting from an exceptional array of 100 wines from around the world. Not a wine drinker? Not to worry, we will have delicious beers and ciders plus nonalcoholic beverages to enjoy. Plus, there will be tasty food offerings from some of the best food carts and restaurants from around the city, live music to keep the day entertaining, a great selection of local vendors and an activity zone filled with fun for the whole family including some snuggle time with Rojo the Llama! No pets or outside food or drink permitted at the event. The Portland Picnic is proud to support Ride Connection, as their 2019 nonprofit beneficiary. Cost: There is no admission cost to enter the festival but tasting packages are required to participate in the wine tasting. Get your tasting packages before the event to save money and be entered for a chance to win the Ultimate Picnic Experience.